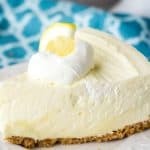 Lemon Cheesecake – this no bake cheesecake just screams Spring and Summer and will be the perfect addition to your Easter or Mother’s Day menu! Leia, from Eat It & Say Yum, here! How are ya?! Spring is nearly here, and the weather is starting to warm up. Yay! And these slightly warmer days have me dreaming of summer. I love eating outside and having barbecues with friends. This is a no-bake cheesecake. Which is great in the summer, so you don’t have to heat up your house by turning on your oven for hours. It just sets up in the fridge. And you can even make this a day or two in advance and just let it hang out in the fridge until you are ready to serve it. The lemon flavor in this cheesecake is pretty heavenly. 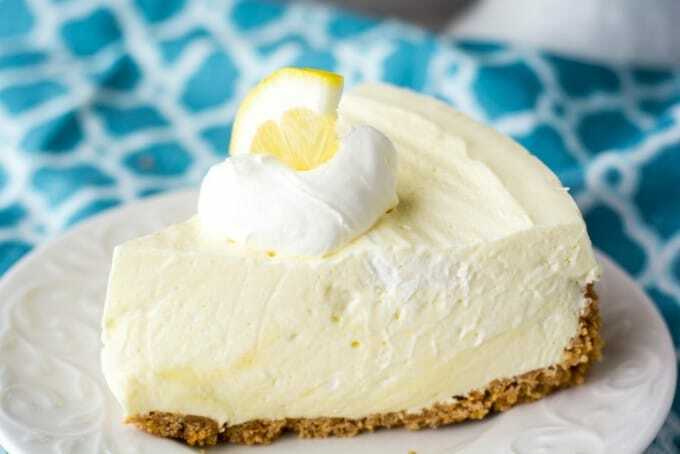 I love the combination of the cool creaminess of the cream cheese with the tart lemon. It really makes for the perfect chilled dessert. Alternatives for a graham cracker crust could be a vanilla sandwich cookie crumbs crust, or vanilla wafer crust. But the graham crackers crust is so easy and it tastes great, there’s really no need to change it. 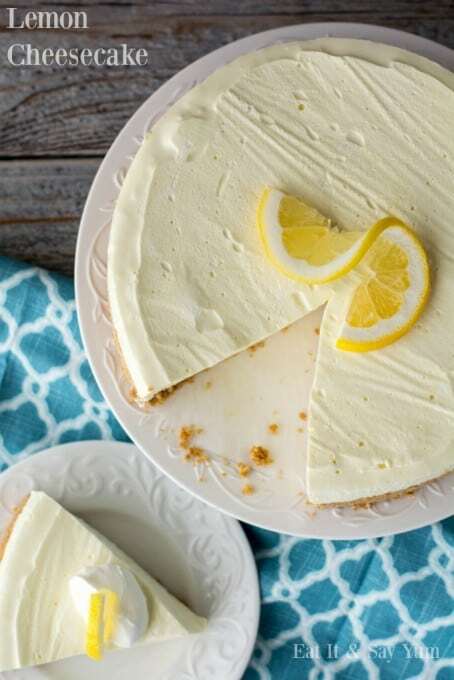 Use these items to make your own No Bake Lemon Cheesecake – Lemon Jell-O, and this springform pan. 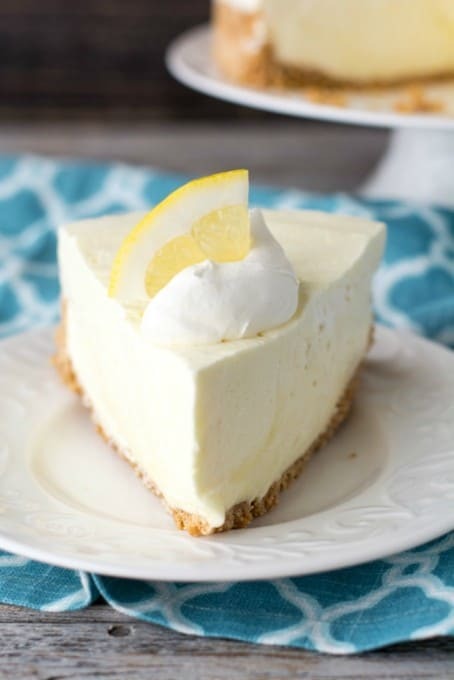 Lemon Cheesecake- a no bake cheesecake that just screams Spring and Summer. It will be perfect served at Easter or on your Mother's Day brunch menu! In a medium mixing bowl, mix the jello, and lemon juice with the hot water. Stir until dissolved, then add the cold water. Set the bowl in the fridge until the jello is completely cooled, but not set. Prepare the graham cracker crust by mixing the crumbs with the melted butter and then press it into a large springform pan, minimum of 10 inches. Set in freezer until ready for the crust. Fold the cool whip into the cream cheese and jello mixture with a rubber scraper. Gently mix until the mixture is smooth and the cool whip is evenly distributed. Click here to see my other posts on 365 Days of Baking and More. Thanks for reading and be sure to check back with us soon for more great recipes! Take a look at these videos on how to make a cheesecake with only THREE ingredients! I love everything lemon – fresh lemon and lemon-flavored desserts. 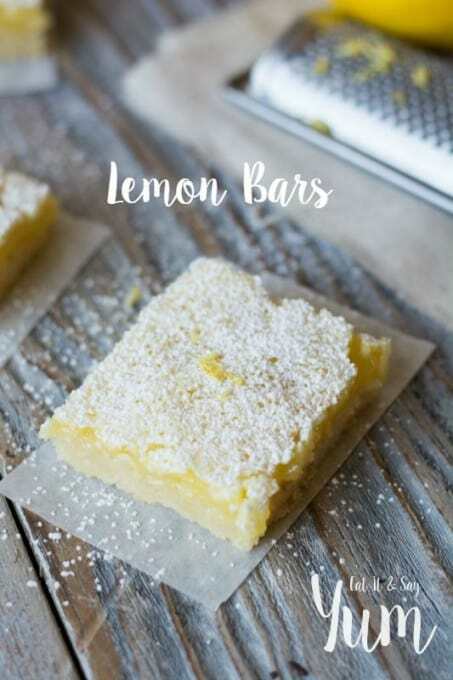 Lemon squares is currently my favorite but I cannot wait to try this recipe – I already know it will be my new favorite. It’s so gorgeous too! Thank you! 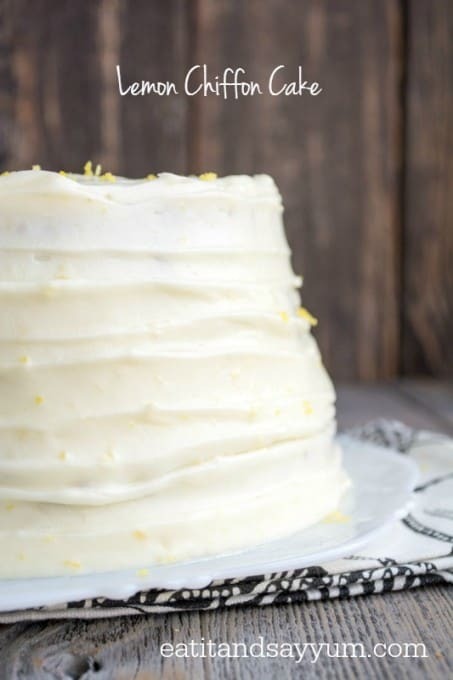 This definitely has great lemon flavor, so I’m sure you will love it!! ? No instructions for where lemon juice is added to mixture. Have you tried it with real shipping cream instead of cool whip! Yes, whipped cream works, too! ? Yes! Real whipping cream is a great substitute for the cool whip! ? I usually always add a little sugar to a graham cracker crust. I read the recipe twice, and found it odd that it doesn’t call for any. Anyway, after making this recipe according to the directions, I will next time add a quarter cup of sugar to the crust mix. The filling was light and flavorful, however not really the consistency of a cheesecake. It reminds me of a jello parfait. Would be a fantastic addition to a summer party. I do add sugar to my graham cracker crusts sometimes. Feel free to do that if you like it that way! ? And yes, this is a great dessert for summer! Hi! Great old recipe. I add a little cinnamon to graham cracker crumbs, too, with sugar. Yum. Thanks so much, Sandra! ? And that cake is SO GOOD! You definitely want that. ? Hello, this is Monika from Germany. I’d like to ask what yello lemon mix and cool whip is as I don’t know what I should buy in a German supermarket. Could you help, please? Monika, my daughter has lived in Germany for 18 years, and she has had to adapt her American recipes with what she can buy in Germany. She uses whipping [sahn schlag?] with a stabilizer to keep the whipping cream thick and hold its shape. Jello? I’ve never heard her say she has used jello for anything, but some large department stores with a large grocery may carry the Jello. Monika, some of the large department stores carry imported American foods. I think it’s supposed to be schlag sahn for whipping cream. LOL! I tried! And Lemon Jello.. I could imagine trying it with “Gelantine”+ fresh lemon juice or a Lemon flavored “Wackelpudding” zum selbst anrühren, Instant oder kochen. I havent made this recipe, but this is how I would try it. Lemon Jello is not the same as jelly. It’s a powdered mix with gelatin in it that you mix with water and it sets up firm. I’m not sure what substitutes might be available where you. If I think of something I’ll let you know. ? And for the graham crackers you could use vanilla wafer cookies, shortbread cookies, any slightly sweet cracker/ cookie should work. Hi Sue, I’m an Aussie and I used lemon jelly (aeroplane jelly brand) and it worked perfectly. I think ‘jelly’ in America is what we call ‘jam’. I used a can of whipped cream instead of cool whip and as we can’t get graham crackers I just used a plain sweet biscuit (I forget what they’re called). It was pretty nice! Jello is a gelatine dessert and is flavoured, in this case lemon. It’s not a jam or jelly. I too would like to know a substitute for Jello (which is a brand name). Maybe I will try a lemon jelly which I can get in the jam section of the supermarket here in Holland. Who knows Alison, it may just be the trick for us outside of North America! I’m not familiar with what ingredients you have available to you, but I hope that helps! Any flavor of jello should work, as long as it’s the same size box as the recipe calls for. And bananas in the recipe should be fine, too. ? Let me know how it turns out! I’m going to try this with strawberry jello instead of lemon and add fresh strawberries and cream on top. Hope it turns out ok, going to try it for Easter. That sounds delicious, Barb! Enjoy! On the no bake lemon cheesecake, couldn’t find 6oz box of lemon jello mix, do you mean pudding mix? No, I definitely use Jello. It the bigger of the two sizes that Jello comes in. ? I should have read the comments before I made this. The ingredients don’t specify whether to use lemon jello gelatin or the lemon jello pudding/pie mix. I chose the latter and it definitely is more of a pudding texture than cheesecake. Still super yummy, just not what I was expecting. Maybe the ingredients could be more specific, please? Holly, it would be lemon Jell-O gelatin. Sorry for the confusion. This recipe is amazing – the best cheesecake I’ve ever had. I had this for Easter and everybody loved it. It’s so light and refreshing, a little tangy, but not too much. I only found lemon Jello in 3oz boxes, so I used two boxes and I made my cheesecake with whipping cream instead of cool whip. The 16 oz heavy whipping cream worked perfectly. I added a little powdered sugar to the whipping cream for sweetness and powdered sugar also helps to stabilize a homemade whipped cream. This is the cheesecake I make from now on! Pat, I’m so glad to hear this! Thanks for letting me know of your success!! Making this now for our family reuion tomorrow! Made a rice crispy crust for it! Cannot wait to try it!!! Thanks for this recipe! What a great idea with the crust, Michelle! I hope the family enjoyed it! can I just buy lemon juice instead of squeezing a lemon and how much juice would I need ? I love lemony desserts too! Another great one is Key Lime Pie. I’d like to try a recipe for a no-bake Key Lime Pie for sure in this heat we’re having! 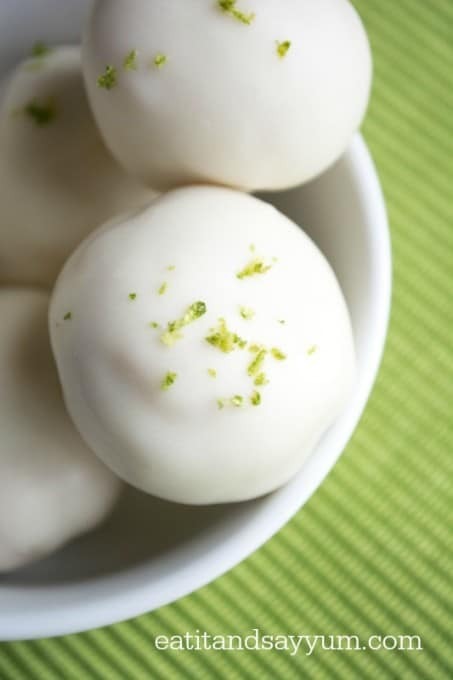 Key Lime Pie does sound delicious right now! And a no-bake recipe would be great in the summer! Yes! You would just serve the cheesecake right from the pan, instead of removing it- like when using a springform pan. Good luck! Is the recipe 1 and 1/2 cups water or just 1/2 cup each of hot and cold. I used 1 and 1/2 each and after chilling all night it is looking too soft. For a replacement for the lemon jello you can try this link, I haven’t personally tried these substitutes, but they might work. I’m sorry you don’t have Jello available where you live! Good luck! Are some of these measurements fluid and some are weight? I’m in Canada, and I was able to convert all but the Cool Whip. This was fun and easy to make and it was delicious. I don’t own a spring form pan so I bought a large extra serving Graham crust. If doing this, the filling amount can be cut in half, I had a lot of extra (yum!). Very nice this Lemon cheese cake recipe!! Cake is looking so scrumptious . Thanks for saring this nice cake ideas. It’s a powdered mix with gelatin in it that you mix with water and it sets up firm. I’m not sure what substitutes might be available where you. If I think of something I’ll let you know and thank you very much for sharing such a beautiful post. Can you use a ready made pie crust? I don’t see why you couldn’t, Tracy. And yes, a graham cracker crust would work as well!